New readers might never have heard of the famous Rusty Pole of Mill Street, Oxford. But now you will. It’s a fascinating tale about bureaucracy, in its own way. You can read more about it here. 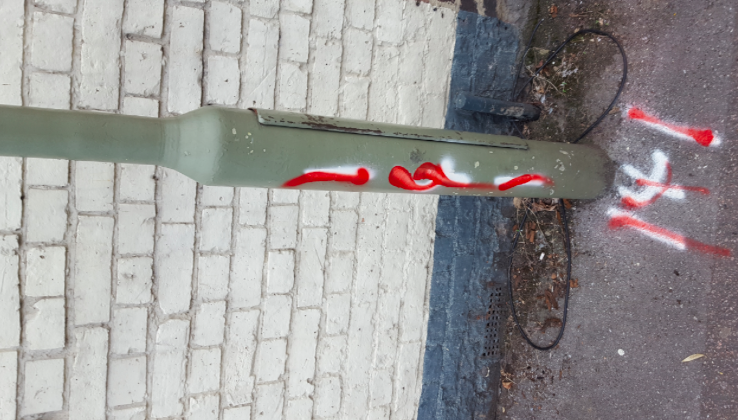 Now Oxfordshire County Council (OCC) has decided to repaint the lamp posts on the other side of the street, paying scant attention to the rusty poles on the east side of the street. When Nicola Blackwood was MP for this part of the world, she escalated protests to the highest authorities at the OCC, and eventually it emerged that the rusty poles could be painted, but at a prohibitive cost and using only standard black paint. Our colleague over at Volesoft.com, Moniker, has spotted a new twist to the old take of the Rusty Pole. You can read all about it here. Yesterday we were very, very privileged to attend a very, very poorly publicised consultation at the Oxford Town Hall about the proposed plan to “regenerate” West Oxford by building a new station. Estimated date? The building work is scheduled to start in a couple of years. It was poorly publicised because, unlike Network Rail, we don’t get any letters through our doors from the Council telling us about this sort of thing. It’s up to the local communities to use their antennae to figure out what’s going on. It’s also, here in Blighty, when many people are away on their holidays. Shock. Not only was the consultation poorly publicised, when we arrived at the Town Hall there were no notices to tell any interested parties where the two events were being held. One was downstairs and one was upstairs – in the jurors’ room, ironically. There were two contingents there – one from an aggrieved set of people from Cripley Road and Abbey Road – and a smaller contingent from Mill Street. As far as we could tell, there was little representation of the people from Becket Street – as far as we can tell, they’re the people that will be most affected by the redevelopment of the railway station. The meeting was chaired by one Fiona Piercy – you can find her profile on Linkedin, here. The Cripley/Abbey road mob marched to the Town Hall with placards, headed by Julian Levey, apparently the representative of the two streets. The people that live there are, it seems to me, justifiably aggrieved by the proposed plan that will fell a fine set of lime trees and use Cripley and Abbey Roads as a set down spot when and if the new station comes to pass. We predict the station will come to pass, and a carrot will be thrown by the council and Network Rail to satisfy the Cripley/Abbey residents. Mr Levey, who appeared to have assumed the role of chairing the residents of Mill Street and the Cripley/Abbey road mob, got quite hot under the collar because no-one was there from Network Rail, an organisation described by other local residents as a “monster”. Mind you, nobody was there from Christ Church either. Nor the bus companies, which will be terribly affected by these proposals. Basically, the plan is to destroy the car park on the eastern side of Mill Street, and replace it with a load of blocks including a hotel, a big underground car park, some shopping stuff and some student accommodation. The plan is to shut down Gloucester Green bus station and shunt local and longer range buses in a dedicated area opposite the poor under represented people that live on Becket Street. The City Council has some weird idea that in West Oxford we need more student accommodation. For example, there is a plan to turn the old Power Station into luxury apartments for would be students that are doing MBAs at the Said Business School – famous throughout the world for its Margaret Thatcher wing. Ms Piercy seemed to not have a clue what was happening there. One Mill Street resident pointed out that the communities of Cripley/Abbey and Old Osney island – that is to say, Mill Street – were divided by the equivalent of the Norse Ginnungagap. In plain terms, that gap is the already congested Botley Road. Still, let’s look on the bright side. The Tunnel of Love under the existing railway bridge will be replaced by a deeper tunnel allowing traffic to proceed in an easterly direction towards damned Frideswide Square. Neither fish nor fowl, motorists nor pedestrians can figure out the right of way. But hey, that’s communities for you, and visitors to the railway station. And, talking about bridges, the footbridge from the west side of the railway to the east side is going to be revamped, although there appears to be some doubt whether it will enter the underground car park or not. It might even have a ramp so the druggies at the cemetery can bike it back to wherever they come from. The “consultation” lasts from the 30th of June to the 25th of August. The document, badly proofread and referring to the Batley Road (sic) “is a major opportunity in the station area and will need to contribute to and enhance the station and its immediate surroundings”. One resident commented off the record that Oxford is already congested by cars and buses and thought that the idea of creating yet another place for cars to park is a very retrograde idea harking back to the 1960s, 1970s and 1980s. We can only conclude from this “consultation” that whatever Oxford City Council planners might or might not be, they’ve never heard of “joined up” thinking. There’s a report and pictures in the Oxford Mail, here. Your mother well hath pray’d and prove you true.” Bolingbroke, Henry II, by Wm. Shakespeare. This is a super pub on St Giles’, Oxford. The beer is good and well kept, and also pretty inexpensive too. Don’t expect to pay with your credit card because the pub only takes cash. It’s been there for 500 years but you don’t have to be 500 years old to enjoy it. Recommended as a nice pub and a great place to meet others. IN BRIEF The excellent Haymans fisheries in Osney Mead will be closed during Oxford for a refurb. But the equally excellent restaurant upstairs will open for business on the 8th of August 2017. Until last year we were privileged to have a local pub in Mill Street – The Kite. The new lessees have decided to re-brand as the Porterhouse and it is supposed to open in May. But last week The Kite – or part of it at least – was painted “charcoal grey”. The local Camra publication said it would open at the end of May. We wonder if that is going to happen.